MiCloud Connect is a full-featured communications and collaboration solution that empowers users to work more efficiently and productively no matter their location. Our focus on ease-of-use and the mobile workstyle delivers streamlined features and intuitive interfaces so users can easily interact with each other and not have to focus on making the software work. By delivering a total solution, users will benefit from a complete communications and collaboration suite so they can interact in ways that they prefer. MiCloud Connect mobile and web solutions make it easy for you to work from anywhere, from any device. Within the MiCloud Connect Portal, admins can do a variety of things such as manage their users and groups as well as their phones. Get up and running fast and move to the cloud with ease. Consolidated bundling streamlines the payment process so customers only have one bill for all of their unified communications, collaboration and contact center needs. MiCloud Connect packaging and pricing is available in three different types of licenses – Essentials, Premier and Elite. Licenses can be mixed and matched to ensure employees have the right features for them. Service levels can be changed on-demand to adapt to evolving business needs. Customers want to feel confident that their solution is always running at top performance. 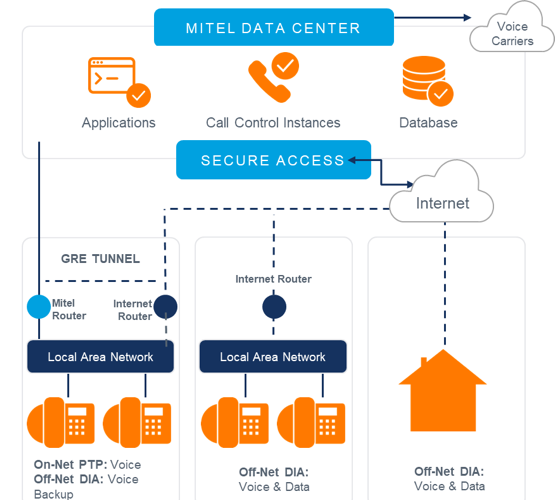 To ensure business continuity and put you at ease, Mitel offers a variety of connectivity and backup circuit options so you’re always prepared for the unexpected. Mitel Teamwork is more than just group messaging. Teamwork provides employees with access to virtual workspaces where employees can come together to work closely and communicate effectively all in a secure environment.